CHICAGO, Illinois, February 11, 2014 (ENS) – In 1901, visitors to the first Chicago Auto Show in the old Chicago Coliseum saw the latest models of electric cars right alongside petrol-powered vehicles. Back then, 38 percent of automobiles on U.S. roads were powered by electricity. Manufactured in Indianapolis, Indiana, the electric-powered National line of vehicles occupied one of the largest spaces on the main floor with electric runabouts, four-passenger models and wagons. Fast forward to Saturday, when the 2014 Chicago Auto Show opened to the public at the McCormick Place, the nation’s largest convention center. Out on the one million square foot exhibit floor, 11 gleaming electric or hybrid-electric cars and one fuel cell model are displayed. The two most prominent electrics on the floor are the extended range Chevrolet Volt and battery-powered Nissan Leaf. But there are many others. There’s the 2015 BMW i3, with its all-carbon-fiber body and electric motor mounted low in the rear axle. Going on sale in the United States in March, it features 22 kWh worth of lithium-ion batteries parked inside an aluminum frame with a single-piece, carbon-fiber body shell enclosing that. This car is BMW’s response to the demand for mega-city-mobility, with zero local emissions, near-zero noise, and a range of 75 miles (120.7 km). On view is the Cadillac ELR, a luxury plug-in hybrid compact coupé developed and manufactured by General Motors. The ELR’s 16.5 kWh lithium-ion battery pack powers about 35 miles (56 km) of range and enables a top speed of 100 mph (160 km/h). Deliveries to retail customers in the United States began in December 2013. The ELR powertrain is a re-tuned version of the propulsion system used in the Chevrolet Volt, which is also on display here in Chicago. Chevrolet is also showing the Spark EV, a five-door urban mini electric car with 130 horsepower for quick acceleration and an EPA-estimated combined city/highway 119 MPGe fuel economy equivalent. 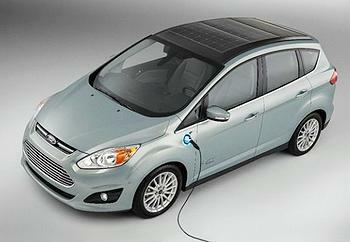 Ford is showing its C-MAX Solar Energi, a hybrid-electric car that uses a Fresnel lens to magnify the power of the Sun eight-fold, generating enough energy to operate entirely off the grid. Also in the Ford display is the Ford Focus Electric, powered by a lithium-ion battery and bearing an EPA-estimated rating of 110 city MPGe. The EPA estimates the range at 76 miles on each charge with a top speed of 84 mph. Honda is showing two zero-emission vehicles – the Honda FCEV Concept powered by hydrogen fuel cells, and the battery-powered Fit EV. Honda’s next generation fuel cell-electric vehicle, launching in 2015, will contain the world’s first application of a fuel-cell powertrain packaged completely in the engine room of the vehicle. Compared to the earlier Honda fuel cell car, the FCX Clarity, the power density of the Honda FCEV is 60 percent greater, and the stack size is smaller by 33 percent. 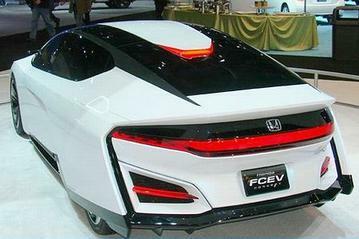 The 2015 Honda FCEV is expected to deliver a driving range of more than 300 miles with a quick refueling time of about three minutes at a pressure of 70 MPa. At the Chicago show, Honda representatives predicted that while the FCEV is a concept, it points toward a very real future. Kia brought its new Soul EV, the South Korean company’s first all-electric, zero-emissions car to be sold in the United States. It is expected to hit the U.S. marketplace in the third quarter of this year. Offering an expected 100 miles of range, the front-wheel drive Soul EV is powered by a high capacity lithium-ion polymer battery engineered for thermal stability and safety. Out on the Chicago show floor is the 2014 Smart ForTwo Electric Drive, a two-seater mini city car manufactured by Daimler AG. The nonprofit American Council for an Energy-Efficient Economy last week put this little car atthe top of its annual “Greenest” list with a highest-ever score of 59 out of 100, just in time for the vehicle’s U.S. rollout. And finally, Volkswagen’s first fully electric vehicle for the United States, the 2015 eGolf Electric, is on display in Chicago. It runs on a 115-hp electric motor with a top speed that is electronically limited to 87 mph. The eGolf Electric is scheduled to go on sale in select states in the fourth quarter of this year. If visitors to the 1901 Chicago Auto Show could see today’s electric cars, they would be amazed. The 2014 Chicago Auto Show runs through Feburary 17.